A survivor returned this week to the Magdalene Laundry where she had been forced to spend her youth. Mary Merritt at High Park last week. MARY MERRITT FIRST entered the High Park Magdalene Laundry in 1947, at the age of 16. Born in a Dublin workhouse, she was put into the care of the Sisters of Mercy in Ballinasloe, Co Galway when she was two. Mary (85) never met her mother, and has never found out who she was. “To this day I don’t know who my mother is,” she told TheJournal.ie last week. I’m 85 now, I’ll be 86 next month. After 14 years in the orphanage in Ballinasloe, Mary (who was known as Mary O’Conor at that time) said she went out one night with four other girls and stole some apples from a nearby orchard. “They came into me the next morning – on the 7th of January 1947 – and they said O’Conor get your clothes together, you’re going to a situation in Dublin,” said Mary. Two nuns brought me down to Westmoreland Street Station, put on a train, sat each side of me, and brought me up to here. “Here” was the Magdalene Laundry at High Park Convent in Drumcondra, Co Dublin. Mary was to spend the next 14 years at High Park where she was given the name Attracta by the nuns. She spent that time living in harsh conditions, dealing with psychological trauma and abuse and doing the endless amounts of laundry delivered from hotels and colleges around Dublin. “We had a terrible time. We got up for mass at 6 o’clock in the morning,” she said. “We went in and we had a bit of breakfast, a bit of porridge, we went from there down to the laundry and we worked in the laundry then until 12 o’clock. “Then we had cabbage and potatoes for our dinner and we went back down to the laundry again and we worked there until half past six/seven o’clock. And then they’d bring us in then we would have prayers and we would got to bed. And that was our day every day of the week for 14 years. I’ll never forget it. Similar Laundries – centres run by the Catholic Church for so-called “fallen women” – existed in other locations in Dublin and Ireland for decades. 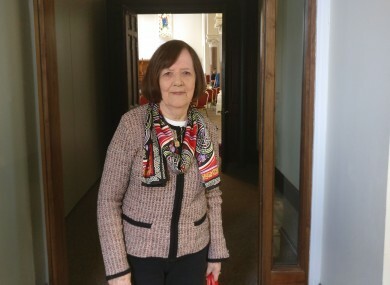 Mary spoke to TheJournal.ie in the chapel of the old laundry where she had lived over 60 years ago. She was a guest at the official opening of the High Park Family Hub – new group accommodation from Respond! Housing Association for homeless families. Addressing a gathered crowd – which included Housing Minister Simon Coveney – Mary spoke of the hardships she endured while at the laundry and thanked people for changing the building into a place for families to live. “I had a very difficult time here,” she said. I was raped by a priest and sent to a Mother and Baby Home before being sent back here. Mary has spoken previously of how she had become pregnant and had her child taken off her at the Mother and Baby Home. A Daily Mail article from 2014 details how she met with the daughter who was taken from her decades later. Speaking to TheJournal.ie after her speech, Mary said the nuns didn’t usually physically abuse her while she was at the laundry, but they mentally broke her down. “They use to cut my hair and if I did anything wrong they’d bring me down to a room,” she said. “It was small and we used to call it the hole. They’d put me in it with nothing to eat and no windows. Then they would cut my hair to the bone. And then they’d bring me up and make me apologise in front of the whole room, kiss the floor and apologise. Mary also said that food was scarce and the portions small at the Laundry. While she spoke to us, her husband Bill Merritt held her hand throughout, interrupting from time to time with his condemnation of what had happened to his wife early in her life. Mary said she was finally released by the nuns in 1969, with no clue where she was supposed to go. She was 31 and had lived in institutions for her entire life. “The clothes I went in with of course at the age of 16 didn’t fit me so they gave me some bits of old rags I don’t know what they were, and I went out and I didn’t know what to do.” she said. And I said ‘they’ve just put me out of High Park and I have nowhere to go’. Mrs Cronin – who Mary kept in touch with until her death three years ago – took her back to her house. She brought me back to her house, she put me up, she gave me a bath, she gave me clothes, and she brought me down the next morning and said I’m going to get you a job somewhere and somewhere to live. Mary got a job with Marlowe Dry Cleaners O’Connell Street. She moved into her own small flat and set about beginning a life outside of the institutions. She eventually moved over the London to work in the cleaners over there, where she met her husband Bill. “Bill was in the Royal Marines and he came in to get a job in the cleaners,” she said. And 50 years on we’re happily married. The pair started a family and bought a chain of dry cleaning stores, before selling the business and retiring. Mary now spends time working for justice for other survivors like herself. She said that the conversion of the old building into homeless accommodation for families in need was a positive step and that she was happy to see the building where she had suffered being put to good use. She said she harboured no anger with the State now for what happened, but that she was still angry with the Church. “I am angry with the church. I’m very angry with the church,” she said. “The last time I was in a church was the day I got married. “But I still believe in it, don’t get me wrong. And I still say my prayers at night… and I think keeping that bit of religion has helped me along the way. And I still thank God for what I have today and for bringing me through what I went through. Email “'They’d put me in a room with nothing to eat and no windows. Then they would cut my hair to the bone'”. Feedback on “'They’d put me in a room with nothing to eat and no windows. Then they would cut my hair to the bone'”.